Adequate fruit and vegetable consumption is examined in terms of the percentage of the population aged 12 or older who reported eating fruit and vegetables at least five time daily. This variable examined frequency of consumption, not the quantity consumed. Thus, it does not translate to number of servings per day. Evidence suggests that this health indicator is a reasonable proxy for good eating habits1. A diet rich in fruit and vegetables may help to prevent cardiovascular disease, certain cancers and obesity2,3,4,5,. Women eat fruit and vegetables more frequently than do men, although men diagnosed with cancer, heart disease, high blood pressure or diabetes tend to consume these foods more often than do men without these conditions6. Low frequency of fruit and vegetable consumption is associated with other health risk behaviours: namely, physical inactivity, smoking, obesity and alcohol dependence6. Data from the 2004 Nutrition survey indicated that 7 out of 10 children aged 4 to 8 had less than five servings of vegetables and fruit a day. At ages 9 to 13, 62% of girls and 68% of boys did not meet this level. Consumption was somewhat higher among adults, but around half fell short of the five-serving recommendation7. Canadians are increasingly likely to consume fruits and vegetables 5 or more times per day. Females were more likely than males to consume fruits or vegetables 5 or more times each day. 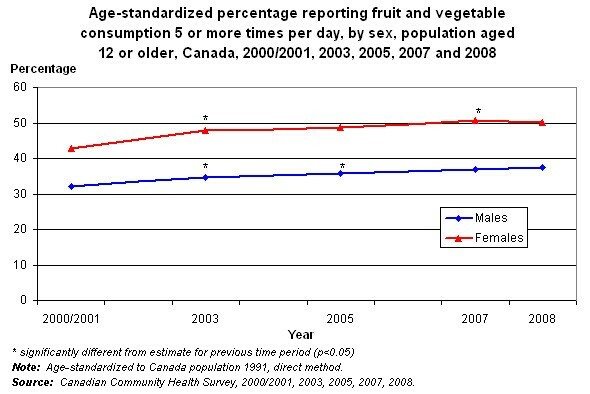 In 2008, 50.1% of Canadian females (6.8 million) and 37.0% of males (4.8 million) reported consuming fruits and vegetables 5 or more times per day. In all age groups except 12 to 17 (where there was no significant difference), females were more likely than males to report consuming fruits and vegetables 5 or more times per day. 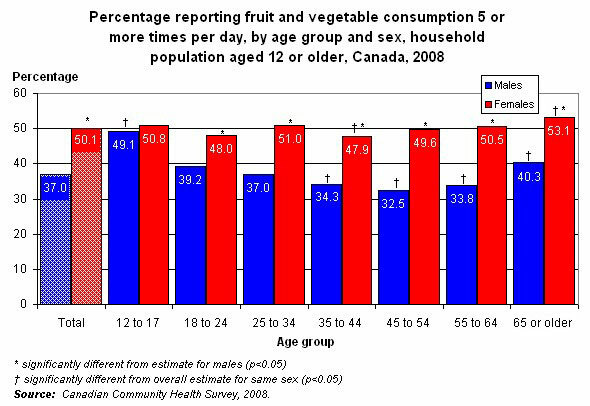 Among males, 12- to 17-year-olds (49.1%) and seniors (40.3%) reported higher percentages of fruit and vegetable consumption than did Canadian males overall (37.0%). At ages 35 to 64, males were less likely than Canadian males overall to report eating fruit and vegetables 5 or more times per day. The frequency of fruit and vegetable consumption among females remained relatively consistent at about 50% for most age groups. 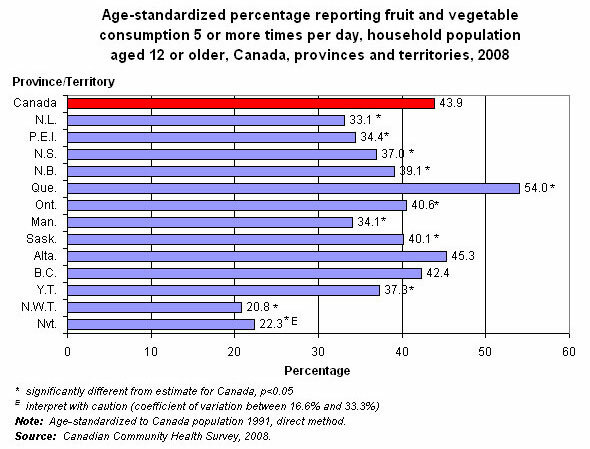 The age-standardized percentage of Canadians reporting consumption of fruit and vegetables 5 or more time per day varied widely across the country. Quebec was the only province or territory where the percentage of frequent fruit and vegetable consumption significantly surpassed the percentage for Canada. Percentages of residents reporting frequent fruit and vegetable consumption were lower in Nunavut, Northwest Territories and Yukon, compared with Canada overall. This may be related to cultural differences in diet or to the availability and expense of fruit and vegetables in more remote areas. The frequency of fruit and vegetable consumption was below the percentage for Canadians overall in Newfoundland and Labrador, Prince Edward Island, Nova Scotia, New Brunswick, Ontario, Manitoba, and Saskatchewan. 1. Garriguet D. Diet Quality in Canada. Health Reports (Statistics Canada, Catalogue 82-003) 2009; 20(3): 1-12. 2. Block G, Patterson B, Subar A. Fruit, vegetables, and cancer prevention: a review of the epidemiological evidence. Nutrition and Cancer 1992; 18(1): 1-29. 3. Steinmetz KA, Potter JD.Vegetables, fruit, and cancer prevention: a review. Journal of American Dietetic Association 1996;96(10):1027-39. 4. Ness AR, Powles JW. Fruit and vegetables, and cardiovascular disease: a review. International Journal of Epidemiology 1997; 26(1): 1-13. 5.World Health Organization. Fruit, vegetables and NCD prevention. World Health Organization 2009. 6. Perez CE. Fruit and vegetable consumption. Health Reports (Statistics Canada, Catalogue 82-003) 2002; 13(3):23-31. 7. Garriguet D. Canadians' eating habits. Health Reports. (Statistics Canada Catalogue 82-003) 2007; 18(2):17-32. Dietitians of Canada, BC Region; Community Nutritionists Council of BC. The Cost of Eating in BC, 2007. Dietitians of Canada, Alberta and the Territories Region; Alberta Community/Public Health Nutritionists Food Security Subcommittee. The Cost of Eating in Alberta, 2008. Garriguet D. Obesity and the eating habits of the Aboriginal population. Health Reports (Statistics Canada, Catalogue 82-003) 2008; 19(1): 21-35. Statistics Canada. Nutrition: Findings from the Canadian Community Health Survey. Overview of Canadians' Eating Habits, 2004 (Catalogue 82-620) Ottawa: 2006.